In February, almost a year's pay vanished from my accounts. It went up in smoke, disappeared, and gave me nothing in return. What should I do about it? What should I not do? Move My Investments to Something Safer! When the market goes down, many people, particularly inexperienced investors or those who do not really understand the stock market, just want out. They are afraid that even more of their wealth will disappear and they decide to head for the safety of a bank account, but often all this does is locks in a loss. Why is my investment losing money? What would need to change in order for it to make money? Let's look at those questions with respect to some investments I've discussed on this blog. Why is my investment losing money? My investment is losing money because Lending Club and Prosper's rates are too low for the risk the borrowers pose. When it became apparent that more people wanted to invest in their notes than wanted to borrow money, Lending Club and Prosper lowered their interest rates/loosened their standards to attract more borrowers. Since Lending Club and Prosper make their money servicing the loans rather than investing in them, it is to their advantage to write more loans. As an investor, I have no control over the underwriting of the loan and no expertise that would allow me to design a meaningful filter to check Lending Club or Prosper's underwriting. What is the purpose of this investment? I invested in these notes because I wanted income and wanted some liquidity. They are still providing limited liquidity--each day I have the choice to re-invest money paid to me, or to withdraw it. As an example, this week I will be withdrawing $155 from Lending Club and $131 from Prosper, and those are sums that have accrued this week. However, last year my interest only exceeded the amount lost to defaults by a small amount, so this investment is not providing the income expected. What are the other options? The traditional income investment is bonds and/or bond funds. They provide income and liquidity. Yes they can go up and down in price (and lately bond funds have been decreasing in value) but they have a longer history than peer-to-peer lending and there are professionals on both sides of the bond transactions, whereas with peer-to-peer lending the party with the knowledge to properly price those notes has more interest in the loans being made than in them being paid. Conclusion: I'm withdrawing money from Prosper and Lending Club. I'm not saying I'll never invest with them again, but the odds are against it. I think buying a diversified bond fund is safer and the income more predictable. While my overall return now is better than what most bond funds pay, the economy is good. If a downturn occurs, I expect defaults to rise and right now, my account can't take more bad news and remain profitable. All of my investment accounts are worth less than they were two months ago. I made lots of money in the stock market last year; am I going to lose it all this year? Who knows? Why is my investment losing money? The talk of tarrifs is what the professionals blame last week's problems on. Whatever the problem is, I have a lot of company. Most stocks and mutual funds were down about the same percent as I was. What is the purpose of this investment? The purpose of investing in the stock market is long term growth. Statistically speaking no other investment has outpaced inflation over the long term. However, historically speaking the stock market has had its ups and downs. The market may be down this month for whatever reason, but there is no reason to think that it won't eventually go up again. Since this is money meant for long-term growth, I can afford to wait. What are the alternatives? Bonds, bank accounts, real estate. Long-term all pay less than stocks. Conclusion: Selling stocks because of a market decline just locks in losses. Market declines are going to happen, but long term, the market, as a whole, is a winner. Market declines are good times to buy stock if you have extra cash sitting around. If you own shares in XYZ (fictitious company) and they fall, then it is time to look at XYZ. Why is my investment losing money? Hmm...beats me, but the market has a whole as dropped about the same as XYZ. Well, it is likely that when the rest of the market recovers, so will XYZ. If you want more XYZ this could be a good time to buy. XYZ just got sued in a big case. XYZ just changed CEOs--the last one went to jail. No one is buying XYZs products and they've laid off half their workforce. The price of XYZ has decreased because the value of the company has decreased. If you believe the company's prospects are good despite this news, hang on for a bumpy ride. If you have no reason to believe the market is wrong, then get out while you still have some value. Conclusion: If an individual stock falls, find out why. Use the answer to that question to help you decide whether your money would best be deployed elsewhere. The trick, of course, is to realize whether your losses are the result of an ordinary market downturn or whether your losses were caused by a problem with the investments. Most advisors suggest NOT watching your investments too closely because it makes you want to take actions that, all things considered, are not in your best interest. Nevertheless you should be aware of how your investments are peforming compared to the market as a whole as well as similar invesments, and if yours are consistently underperforming, you should be willing to change. I've written several posts about my foray into Peer-to-Peer Lending via Lending Club and Prosper, and in the past few weeks I've read several (probably sponsored) articles encouraging people to invest via these platforms. After reading a bunch of blog posts several years ago, investing some money on these platforms seemed like a good idea. Now, after about three years, I am in the process of withdrawing my money and I do not advise anyone to put their money into these platforms. Why? Bank accounts don't pay much, but you know you aren't going to lose money. You can lose everything investing in the stock market, but you can also double or triple your money, or more. The upside of bonds is limited, but the risk of your investment being worthless can be limited by investing in high-quality bonds. After investing via Lending Club and Prosper for three years, I have no trouble saying that the rewards do not compensate the average investor for the risk being taken. Both Lending Club and Prosper warn investors to expect defaults--that's the nature of unsecured loans. Some people will pay them; some people will not. The unfortunate fact is that lenders have to make enough money off those who do pay to compensate for those who do not. At different times, the overall default rate increases or decreases due to the overall economic health of the country. When times are bad, more people lose their jobs and when people lose their jobs, unsecured loans are the first payments skipped. The rates charged for loans have to consider not only what the rate is likely to be today, but what will likely happen if the economy tanks. I'm not earning enough today to convince me that I wouldn't lose money if the economy tanks. Too many people are defaulting now--in April my average balance with Lending Club was about $9,200 and, after defaults, I earned $6.89. Since unemployment is low and the economy is basically doing well, I have to believe I'd lose money if we move toward a recession. Lending Club publishes statistics about its overall portfolio and about what returns can be expected. You can see them here. When I started investing via Lending Club, the norm from which it was hard to stray if you had a reasonable sized portfolio was about 8%; now it is about 5%. Before investing via Lending Club and Prosper, I did my homework. I read articles. I read the statistics on their websites. Everything was showing average returns in the 8% range. With returns in good times in that range, I figured there was room for some defaults in bad times. Then something changed. Interest rates went down and underwriting standards were made less stringent, which resulted, of course, in more defaults. The big difference between Lending Club and your local bank or payday lender is that the bank and payday lender are loaning out their own money. If you don't pay back your loan, they lose money. If a Lending Club borrower defaults, Lending Club doesn't suffer the loss, the investors do. Lending Club makes their money via origination fees and via service fees (they take a small percentage of each loan payment). 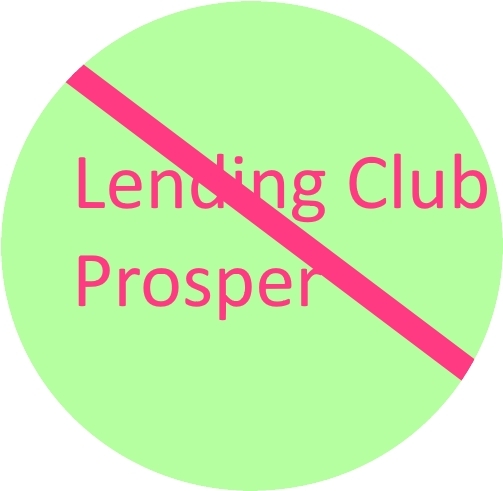 It is in Lending Club and Prosper's best interest to facilitate as many loans as possible. There are two ways the conflict between investors and the platforms comes into play. First, as noted above, is when the platform lowers interest rates or credit qualifications in order to increase loan volume. The second is when the platform solicits current borrowers to refinance loans at a lower rate. The platform gains an origination fee. The borrower (hopefully) saves money. The investor loses because the high-interest loan is paid off early and therefore with less interest. Also the 1% service fee on the lump sum repayment can consume several months interest. I am not an expert on underwriting loans. As a matter of fact, I know very little about it. When loans are offered on Lending Club and Prosper, certain data points are made available to investors, but I lack the ability to analyze that data to determine in the offered interest rates are sufficient. Banks and their computers do not have that problem, and more and more of the loan volume on Lending Club and Prosper are being purchased via computer by institutional investors. I have a hard time believing those computers will not skim the cream of the loans, and I can't even identify the cream. You used to be able to find blog articles about "filtering" Lending Club or Prosper loans--searching the offered loans for those meeting certain criteria that historically (short as "history" was) had done better than average--and then purchasing those loans. NSR Invest offers a tool that allows you to back-test your strategy--to see if filtering out certain loans or looking for others would have increased your return on investment IN THE PAST. The problem is that Lending Club and Prosper can (and do do change the rules at any time. Unless you have a very good understanding of how the criteria for rating loans now compares to the criteria used in the past, you can't use a back test tool to do anything except to see what might have happened in the past. My experience with Peer-to-Peer Lending has convinced me that loaning money to other people is a business best left to those with expertise. Do you agree?